If you didn't notice, I pretty much took a week or so off from writing here on the blog. I needed to take the time to think about what I wanted to do with my blog. 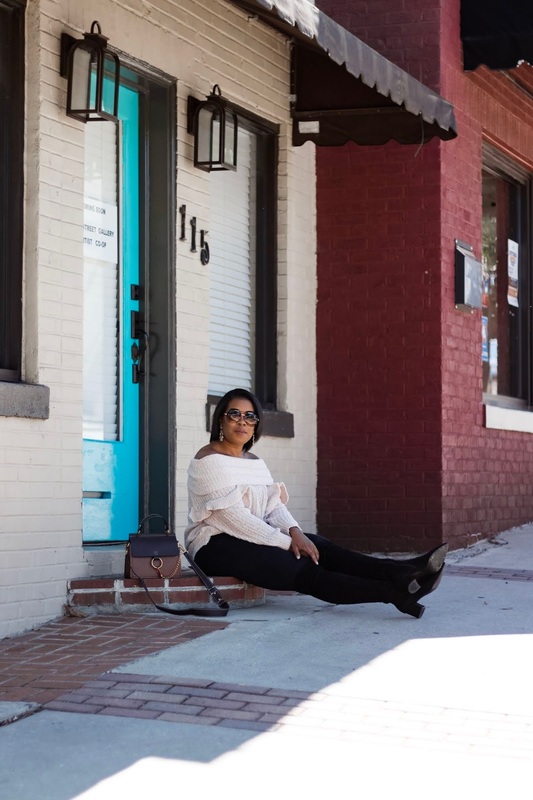 The time away was much needed, as it allowed me to get my creative juices flowing and I have so many things I can't wait to share with you on the blog! 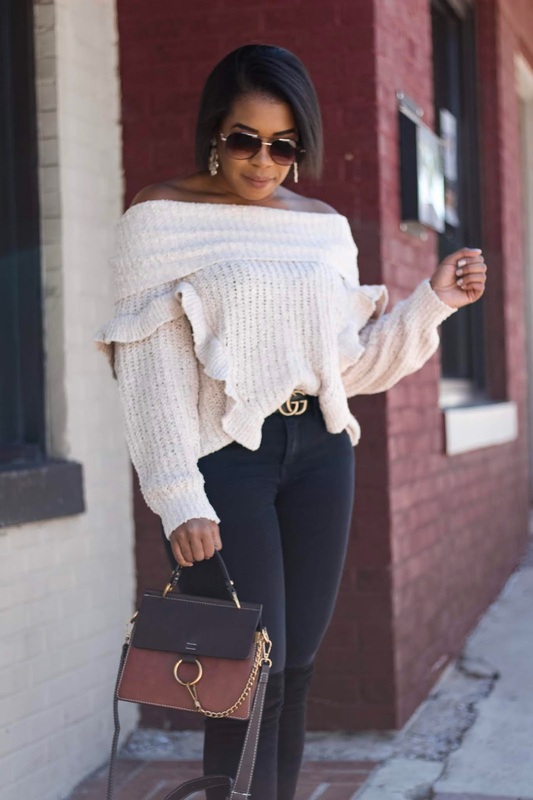 I wanted to come back with an outfit post because it's starting to cool down here in GA and today it dropped from being kind of cold, to just COLD! 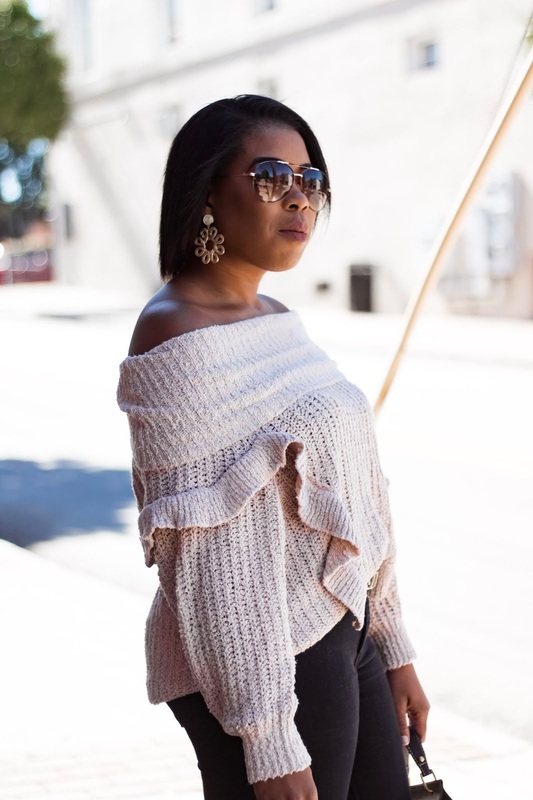 This sweater I'm wearing is a repurchase for me from last year. I picked this up from Express and love how versatile it is. 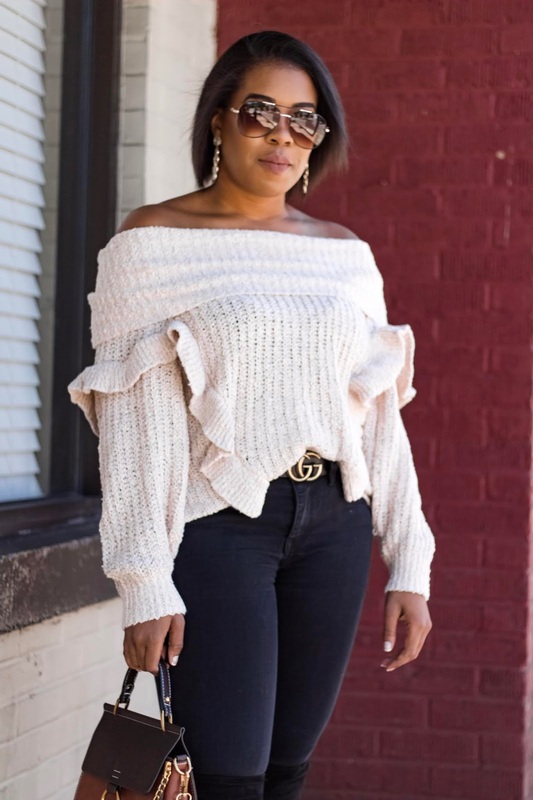 This can be worn on or off the shoulder; when work on the shoulder, I make it become a cowl neck sweater and create a whole different look. I have this sweater in grey but it's only available in the color I'm wearing and pretty olive color. 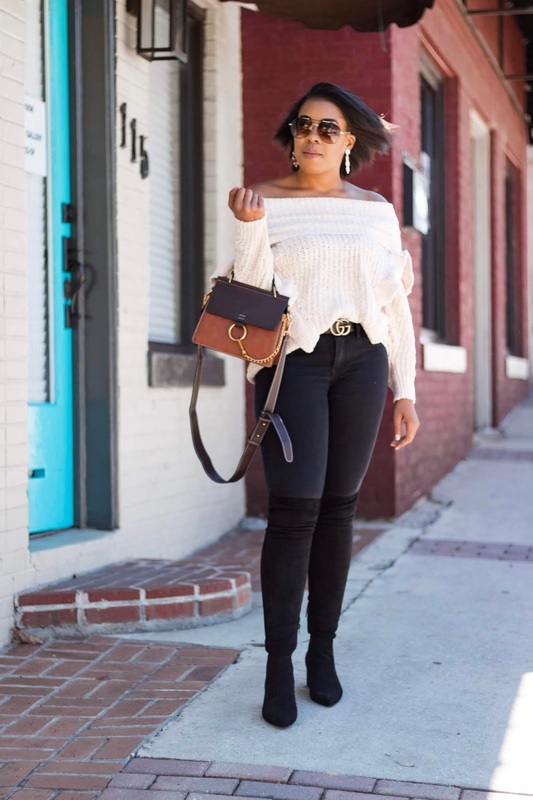 Black jeans are such a staple in any wardrobe and once the temps start cooling down, I find myself reaching more and more for my favorite black jeans. No surprise, my favorite black denim also comes from Express. They have such a wide variety and have become more size inclusive allowing a wider audience to be a consumer. 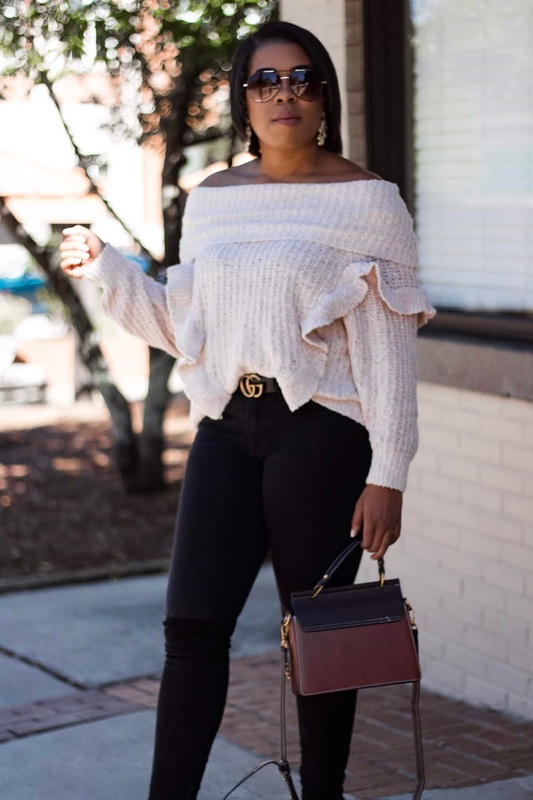 My jeans are currently on sale for 40% off and today is the LAST day to get them on this sale! 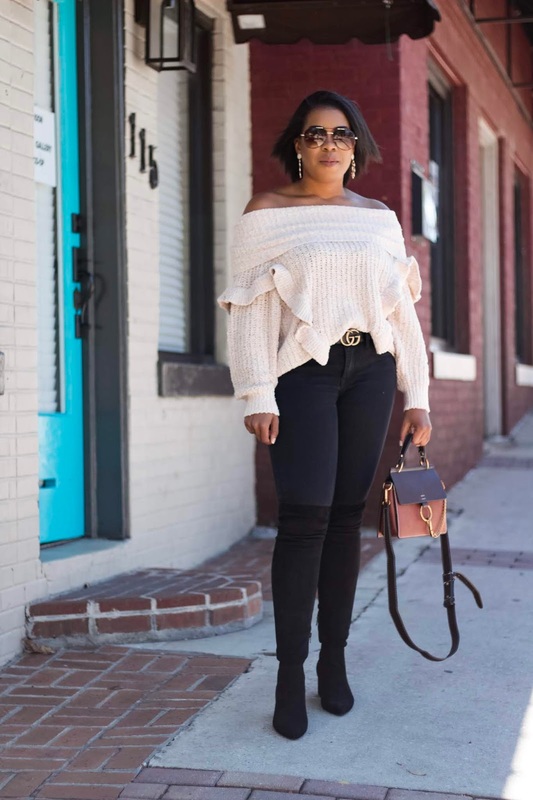 My boots, you've probably have seen every blogger and their mother talking about this boots. They are from Steve Madden and I picked these up during the NSale. They are the perfect everyday boot and because of the heel height, you can wear them all day long. They're currently on sale for 20% at Nordstrom so snag you a pair while you can! The last thing I want to touch on is my purse. This bag is a great dupe for the Chloe bags. As much as I love the look and style of the Chloe bags, I also don't have $2000 lying around to just drop on one handbag. This purse I found on Amazon; this gives me the feel of the Chloe bag but is a lot nicer to your wallet. This comes in a couple different colors and is really great quality. I hope you guys enjoyed todays post. I have some fun content coming your way. I will be doing some gift guides so I would love to hear what you would like to see!